On Saturday, Jan. 4, a group of concerned community members met to discuss the presence and significance of Prioria Robotics, a drone manufacturing company, within the Porter’s community. Bryan da Frota, the company’s CEO participated in the discussion. He explained the construction, models and uses of unmanned aircraft systems (UAS). These include military, surveillance, emergency response, and geographical surveying. He described one of Prioria’s UAS models, the Maveric. It can fly 1,300 ft above ground level with mounted cameras. Its main use is for reconnaissance purposes. It can fly 12–24 hours without stopping and is considered a full aircraft. It takes a team of 20-plus people to maintain support services. He assured the group that this device is not for eliminating people. On Friday, January 24, WGOT will celebrate 6 years on the air with a benefit show at The Atlantic, 15 North Main Street in downtown Gainesville. On the bill are Loose Bearings, New Natives Guys (Valdosta), Human Parts, and Squeaky. It’s almost hard to believe that this January marks 6 years on the air for WGOT! After a laborious application period, the work for which began before the turn of the century, WGOT began broadcasting on 94.7 FM in early 2008. Internet streaming followed about 3 years later. The current arrangement on 94.7 has WGOT sharing that frequency with two other low-power stations — Faith Presbyterian’s WVFP and Calvary Baptist’s WGLJ. Such a shared frequency means that any time you tell someone about the station, you have to go into detail about when to listen. You can imagine the confusion for listeners of any of the three stations. Supporters of medical marijuana in Florida need approximately 683,000 signatures by Feb. 1 to put the issue on the ballot in November, but organizers from People United for Medical Marijuana (running the petition campaign) already collected more than 900,000 at press time. Even if supporters collect enough signatures by the deadline (which looks likely), the Florida Supreme Court still must rule on the legality of the amendment before it appears on the ballot. State officials challenged the initiative, and the parties argued before the state Supreme Court on Dec. 5. Hugo and Nebula award-winning science fiction author Joe Haldeman has just published a new novel entitled “Work Done For Hire,” and he will be speaking and holding a book signing at the Civic Media Center on Saturday, Feb. 1, at 2pm. His new book picks up on themes present in many of his books and is stimulated by his experiences as a soldier in Viet Nam, that of a jaundiced view of war and those that send people to war. This book is a near future thriller and involves a writer who is a veteran of a desert war. Copies of “Work Done For Hire” will be available at the event through Wild Iris Books, which is co-hosting with the CMC. Joe is best known for his 1974 novel, “The Forever War.” That novel, and other works of his, including “The Hemingway Hoax” (1991) and “Forever Peace” (1997), have won major science fiction awards. 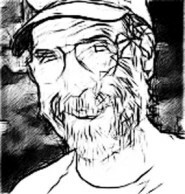 For his career writing science fiction and/or fantasy, he is a SFWA Grand Master and since 2012 a member of the Science Fiction Hall of Fame. Joe splits his time between Gainesville and teaching at MIT. The Civic Media Center is at 433 S. Main St next to Citizens Co-op. My first memory of Jamie Garvey was when I kicked him out of a punk show at the old Common Grounds for drinking under age. Even as I kicked him out he still was smiling and laughing. His laugh was almost a kind of hiccup, a punctuation mark on his various quips and profanities. This is the nineteenth in a continuing series of transcript excerpts from the collection of the Samuel Proctor Oral History Program at the University of Florida. Marquitta Brown was interviewed by Sarah Blanc [SB] in 2010. MB: I was born January 20, 1988. I grew up in Miami, played sports all the time. Every Christmas, it was either a cop toy set and Matchbox cars, no Barbie dolls, none of that. Growing up at first, nothing was dangerous or anything, until twelfth grade. And then, everything was life-changing. Friends that I was sitting by, the next day they wouldn’t be there, they had got shot and killed at some party. So twelfth grade for me was more like, alright, life is serious; I need to get out of here. I had good academics always. I had a lot of domestic violence in my home between my mom and dad. That was my motivation, just to get my grades, go away to school, never come back home. La Via Campesina leaders from Mexico, Canada and the U.S. will be meeting with interested Gainesville community members at the Civic Media Center on the evening of Jan. 29, and at the University of Florida Library East on Jan. 30. Both events are free and open to the public. “La Via Campesina is the international movement which brings together millions of peasants, small and medium-size farmers, landless people, women farmers, indigenous people, migrants and agricultural workers from around the world. It defends small-scale sustainable agriculture as a way to promote social justice and dignity. It strongly opposes corporate driven agriculture and transnational companies that are destroying people and nature,” according to its website. I first met them in 2009 when I was introduced to low power radio at a friend’s house. A year prior, a group of enthusiasts successfully obtained a license to create a locally programmed radio station, WGOT LP 94.7 FM, under the umbrella of the Civic Media Center. A year later, Adam Reinhard became the station manager and John Arana, Eddie Cromer and Adam had music radio shows: In Your Ear, Back of the Bus, and Black Kill Death, respectively. For five years, their volunteer efforts with the station continued until DJ Amy Teague of Front Porch fame put a bug in their ears about joining efforts to create a new eatery at the old Louis Lunch. John was thrilled when they got the opportunity to purchase the old diner. He’d been waiting for the Louis Lunch family to decide they were finished with it and he gladly stepped in to renovate with the help of Adam, Eddie, and a slew of local and family support. The City of Gainesville will be holding elections for three commission seats on Tuesday, March 11. The deadline for candidates to enter the races is Jan. 20, so there may be others joining the fray after press time, but here is where it stands now. Two races are District seats, with the incumbents pretty sure of re-election as there doesn’t seem to be any major controversies or strong opposition. District 2 is Todd Chase, and District 3 is Susan Bottcher. We are just over a month since the death of Nelson Mandela, but I want to spend some words here on ways he and his struggle affected me. In 1963 I was 12 years old and not aware of the South African struggle against apartheid, but in this country others were. Among them was a young man in Berkeley, CA named Mario Savio, who, as one of his first political activities, had gone door- to-door to free Nelson Mandela. A year or so later Savio was one of the movement leaders during the Free Speech Movement. What was the genesis of the FSM? Information tables which were shut down, which had been set up by students who had gone to Mississippi for Mississippi Freedom Summer. My campus experience 1969 to 1973 was greatly impacted by the spirit of student protest which grew nationwide in opposition to the Viet Nam War. Plum Creek, one of the largest Real Estate Investment Trusts in the country, is also the largest landowner in Alachua County. Their roughly 65,000 acres east of Newnan’s Lake include some of the wettest and most remote land left in the county, and straddle an important regional wildlife corridor. For nearly two years, Plum Creek has waged a state-of-the-art public relations campaign to orchestrate support for their plans to develop this land. Numerous “public workshops,” long on pictures and promises but short on specifics, have generated many misconceptions, the most important of which is that their proposal is an expression of the public will. The date for the Civic Media Center’s annual SpringBoard fundraiser is Friday evening, March 21. There will be a new location this year after last year’s venture at Prairie Creek Lodge, and that is in the heart of Downtown Gainesville at the Wooly, 20 N. Main St., a new event venue in what is the old Woolworth building next to and run by The Top restaurant. There will be food from various area restaurants, a silent auction and raffle items, and awards. 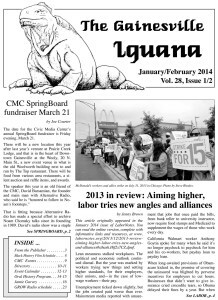 Check out our near-comprehensive calendar for Gainesville and surrounding areas here: January/February 2014 Iguana Community Calendar. Well, don’t worry! We have the whole January/February 2014 issue here for your perusal.